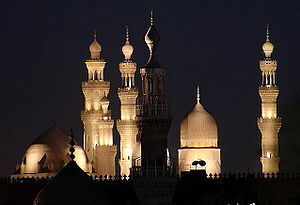 Mosques and minarets in Cairo. Islam is the official religion in Egypt. Religion in Egypt controls many aspects of social life and is endorsed by law. Egypt is predominantly Muslim with a sizable Christian population, although estimates vary greatly in the absence of official statistics. Since the 2006 census religion has been excluded, so the number of adherents of the different religions is usually rough estimates made by religious and non-governmental agencies. The country is majority Sunni Muslim (with estimates ranging from around 80% to 94%), with the next largest religious group being Coptic Christians (with estimates ranging from 6% to 20%). The exact numbers are subject to controversy, with Christians alleging that they have been systemically under-counted in existing censuses. Egypt hosts two major religious institutions. Al-Azhar Mosque, founded in 970 AD by the Fatimids as the first Islamic university in Egypt and the Coptic Orthodox Church of Alexandria established in the middle of the 1st century by Saint Mark. In Egypt, Muslims and Christians share a common history, national identity, ethnicity, race, culture, and language. A common religious scene in Egypt: a mosque next to a church. 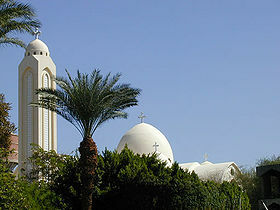 In 2002, under the Mubarak government, Coptic Christmas (January 7) was recognized as an official holiday, though Christians complain of being minimally represented in law enforcement, state security and public office, and of being discriminated against in the workforce on the basis of their religion. According to research by Pew Research Center for the PEW-TEMPLTON Global Religion Futures Project in 2010 estimated 94.9% of Egyptians are Sunni Muslim, 5.1% are Christian, and less than 1% are Jewish, Buddhist, or other religions. The share of Christians in the Egyptian population has according to official statistics been declining with the highest share reported in the past century being in 1927, when the official census put the percentage of Egyptian Christians at 8.3%. In each of the seven subsequent censuses, the percentage shrank, ending at 5.7% in 1996. However, most Christians refuted these figures claiming they have been under-counted. Christians uphold that they represent up to 15 or even 20% of the Egyptian population. In 2017 state-owned newspaper Al Ahram claimed that the percentage of Christians ranged from 10 to 15%, similar to the range claimed by the Washington Institute for Near East Policy. According to 2015 figures from the Central Intelligence Agency (CIA) Sunni Muslims make up 90% of the population, with Christian making up the remaining 10%. A significant number of Sunni Muslims follow native Sufi orders. There are reportedly close to fifty thousand Ahmadi Muslims in Egypt. Estimates of Egypt's Shia Twelvers and Ismaili community range from 800,000 to about two to three million members. 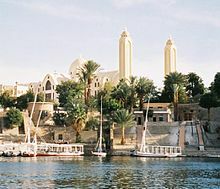 Most Egyptian Christians belong to the native Coptic Orthodox Church of Alexandria, an Oriental Orthodox Christian church. Other Christian denominations include Armenian Apostolic, Catholic, Maronite and Anglican. The Greek Orthodox number between 250–350,000. The most recent declarations, made by Pope Shenouda III and bishop Morkos of Shubra in 2008, claimed that the number of Orthodox Christians in Egypt was over 12 million. Other estimates made by church officials put this number at 16 million. The Coptic Orthodox Church claimed that these figures are based on regularly updated membership records. Protestant churches claim a membership of about 300,000 Egyptians, and the Coptic Catholic Church is estimated to have similar membership figures. These figures would put the percentage of Christians in Egypt between 10% and 20% of the total population. There is a small but historically significant non-immigrant Bahá'í population, estimates place the number at around 2,000 people, and a far smaller community of Jews; an unknown number of Egyptians identify as atheist and agnostic as public expressions of irreligion risk harassment and legal sanctions. The Ancient Egyptian religion declined after the appearance of the Cult of Isis and later Christianity in the 1st century, and was most likely completely extinct by the time Islam arrived in the 7th century. Freedom of belief and worship are formally recognized by the Egyptian Constitution, but are effectively limited by government intervention and sectarian conflict. Some aspects of the country's laws are heavily founded on Islamic principles. Religions other than Islam have typically had to be deemed compatible with Sharia and petition for legal recognition. Although the state provides funds for the construction of mosques and the training of imams, no such aid is extended to non-Muslim communities, whose requests for building permits are often denied or delayed. Individual adherents of minority religions also face frequent discrimination by government officials, who often deny them identity cards, birth certificates and marriage licenses. Authorities often fail to sanction individuals involved in carrying out attacks against members of minority faiths, relying instead on non-judicial procedures in order to avoid offending the Muslim majority. The government also discriminates against Islamic religious minority groups, most notably Shi'a Muslims, who face open official discrimination, including being barred from admission to Al-Azhar University. In 2006 Egypt's Supreme Administrative Court made a clear legal distinction between "recognized religions" (i.e., Islam, Christianity, and Judaism) and all other religious beliefs. This ruling effectively delegitimizes and forbids practice of all but the three Abrahamic religions, and made it necessary for non-Abrahamic religious communities to either commit perjury or be denied Egyptian identification cards (see Egyptian identification card controversy), until a 2008 Cairo court case ruled that unrecognized religious minorities may obtain birth certificates and identification documents, so long as they omit their religion on court documents. While freedom of religion is guaranteed by the Egyptian constitution, according to Human Rights Watch, "Egyptians are able to convert to Islam generally without difficulty, but Muslims who convert to Christianity face difficulties in getting new identity papers and some have been arrested for allegedly forging such documents. The Coptic community, however, takes pains to prevent conversions from Christianity to Islam due to the ease with which Christians can often become Muslim. Public officials, being conservative themselves, intensify the complexity of the legal procedures required to recognize the religion change as required by law. Security agencies will sometimes claim that such conversions from Islam to Christianity (or occasionally vice versa) may stir social unrest, and thereby justify themselves in wrongfully detaining the subjects, insisting that they are simply taking steps to prevent likely social troubles from happening. In 2007, a Cairo administrative court denied 45 citizens the right to obtain identity papers documenting their reversion to Christianity after converting to Islam. However, in February 2008 the Supreme Administrative Court overturned the decision, allowing 12 citizens who had reverted to Christianity to re-list their religion on identity cards, but they will specify that they had adopted Islam for a brief period of time. Coptic Christians, being the largest ethno-religious minority in Egypt, are the most negatively affected by possibly discriminatory legislation. Copts in Egypt have faced increasing marginalization after the 1952 coup d'état led by Gamal Abdel Nasser. Until recently, Christians were required to obtain presidential approval for even minor repairs in churches. Although the law was eased in 2005 by handing down the authority of approval to the governors, Copts continue to face many obstacles in building new churches. These obstacles are not as much in building mosques. Muslims and Christians share a common history and national identity; however, at times religious tensions have arisen, and individual acts of prejudice and violence occur. The most significant was the 2000–2001 El Kosheh attacks, In which Muslims and Christians were involved in bloody, inter-religious clashes following a dispute between a Muslim and a Christian. "Twenty Christians and one Muslim were killed after violence broke out in the town of el-Kosheh, 440 kilometres (275 miles) south of Cairo." In 2005, in Kafr Salama village, Sharqiya governorate, an altercation between a Muslim and a Christian resulted in the death of the Muslim. Muslim villagers later attacked the Abu Sifin Church and several Christian homes and looted several shops before the authorities restored order. In 2006, one person, described by police as drunk and mad, attacked three churches in Alexandria, leaving one dead and from 5 to 16 injured, although the attacker was not linked to any organisation. On January 7, 2010, Muslim gunmen open fire on Christian worshipers leaving a church in Nag Hammadi resulting in the murder of nine Coptic Christians. On January 1, 2011, at least 21 people were killed and 83 injured when a car bomb exploded outside a Coptic Christian church in Alexandria. On 7 May 2011, a church was burnt down in Cairo. Then on October 14, 2012 in the absence of security officials 2 Muslims from a group were killed after they tried to kidnap a woman from a Christian family. In January 2013 when the Muslim Brotherhood was in power, Christian nonprofit organization Open Doors ranked Egypt as the 25th most difficult place to be a Christian, on their annual World Watch List. Islam has been the state religion in Egypt since the amendment of the second article of the Egyptian constitution in the year 1980, before which Egypt was recognized as a secular country. The vast majority of Egyptian Muslims are Sunni, with a small Mu'tazila, Shia Twelvers and Ismailism communities making up the remainder. A significant number of Sunni Egyptians also follow native Sufi orders. Egypt hosts the most important Sunni institution in the world, Al-Azhar University. It is the oldest Islamic institution of higher studies (founded around 970 CE), and is considered by many to be the oldest extant university in the world. The Shia Ismaili caliphate of the Fatimids made Egypt their center, and made Cairo their capital. Egypt's various social groups and classes apply Islam differently in their daily lives. The literate theologians of Al-Azhar generally reject the popular version of Islam practised by religious preachers and peasants in the countryside, which is heavily Sufi-influenced. Sufism has flourished in Egypt since Islam was first adopted. Most upper- and middle-class Muslims believed either that religious expression is a private matter for each individual or that Islam should play a more dominant role in public life. Islamic religious revival movements, whose appeal cuts across class lines, have been present in most cities and in many villages for a long time. According to the constitution of Egypt, any new legislation must at least implicitly agree with Islamic law. The mainstream Hanafi school of Sunni Islam is largely controlled by the state, through Wizaret Al-Awkaf (Ministry of Religious Affairs). Al-Awkaf controls all mosques and supervises Muslim clerics, but the Shafi'i and Maliki madhhabs were mixed together. Imams are trained in Imam vocational schools and at Al-Azhar. The ministry supports Sunni Islam and has commissions authorized to give Fatwā judgements on Islamic issues. About 10% to 20% of Egyptians follow the Christian faith as members of the Coptic Orthodox Church of Alexandria. Egyptian Christians are the largest Christian community in the Middle East by raw number of adherents. The Coptic Christian population in Egypt is the largest Christian community in the Middle East and North Africa standing at between 10% – 15% of Egypt's population according to different statistics. About 95% of Egypt's Christians are members of the Coptic Orthodox Church of Alexandria. an Oriental Orthodox Church, Traditionally believed to be established in the 1st century A.D. by Saint Mark. The Church is headed by the Pope of the Coptic Orthodox Church of Alexandria, attests to Egypt's strong Christian heritage. It has a followers of approximately 20 million Christians worldwide. The Hanging Church of Cairo, built in the third or fourth century AD, is one of the most famous Coptic Churches in Egypt. Other native Egyptian Christians are adherents of the Coptic Catholic Church, the Coptic Evangelical Church and various Coptic Protestant denominations. Non-native Christian communities are largely found in the urban regions of Alexandria and Cairo, and are members of the Greek Orthodox Church of Alexandria, the Melkite Greek Catholic Church, the Armenian Apostolic Church, the Latin Catholic Church, the Episcopal Church in Jerusalem and the Middle East, the Maronite Church, the Armenian Catholic Church, the Chaldean Catholic Church, the Syriac Catholic Church, or the Syriac Orthodox Church. The Coptic Catholic Church (an Eastern Catholic Church) has around 210,000 members in Egypt and roughly 50,000 adherents abroad. It is in union with the Pope in Rome. It is headed by the Coptic Catholic Patriarch of Alexandria, currently Ibrahim Isaac Sidrak. 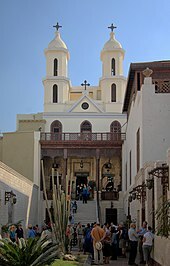 The Greek Orthodox Church of Alexandria (an Eastern Orthodox Church) has around 50,000 adherents in Egypt, out of whom approximately 5,000 are of Greek (Hellenic) descent. The Church has another 1.5 million adherents in Africa and between 10,000 and 15,000 ex-patriates in Europe, North and South America. The current Greek Orthodox Patriarch of Alexandria is Pope Theodoros II. The Melkite Greek Catholic Church (an Eastern Catholic Church) has about 7,000 members in Egypt. The eparchy of Egypt is looked after by a Protosyncellus, and has between 35,000 and 50,000 ex-patriates in Europe, North and South America, and Australia. The Latin Catholic Church has around 7,000 adherents in Egypt. Most are citizens born in Egypt but of foreign descent, like Italians, Maltese and French, or members of the foreign diplomatic corps in Egypt. There are very few native Christian Egyptians who adhere to the Latin Church, and those who do (several hundreds) do so mainly through marriage. The Chaldean Catholic Church (an Eastern Catholic Church) has about 500 members in Egypt. Archangel Michael's Coptic Orthodox Cathedral in Aswan. A noticeable large proportion of Egyptians in Upper Egypt are of Coptic Orthodox heritage. The Evangelical Church of Egypt (Synod of the Nile) (a Protestant Church) has around 140,000 members in Egypt. The Assemblies of God Church, which has around 40,000 adherents in Egypt. The Free Methodist Church, which has 120 churches and has around 10,000 adherents in Egypt. The Christian Brethren Church, which has around 5,000 adherents in Egypt. The Pentecostal Church of God, which has Church around 3,500 adherents in Egypt. The Pentecostal Holiness Church, which has 1,400 adherents in Egypt. The Church of God of Prophecy, which has 1,100 adherents in Egypt. The Seventh-day Adventist Church has 852 adherents in Egypt. Annex of the Library of Jewish Heritage in Egypt, Ben Ezra Synagogue, Old Cairo. Before 1956 and according to the 1948 census there were 65,639 Egyptian Jews, including Karaites. Jews participated in all aspects of Egypt's social, economic and political life; one of the most ardent Egyptian nationalists, Yaqub Sanu' (Abu Naddara), was Jewish, as were the musician Dawoud Husni, popular singer Leila Mourad and filmmaker Togo Mizrahi. For a while, Jews from across the Ottoman Empire and Europe were attracted to Egypt due to the relative harmony that characterized the local religious landscape in the 19th and early 20th centuries. After the 1956 Suez Crisis, a great number of Jews were expelled by Gamal Abdel Nasser. Their Egyptian citizenship was revoked and their properties were confiscated. A steady stream of emigration of Egyptian Jews followed, reaching a peak after the Six-Day War with Israel in 1967. As of mid-2016, there were a total of 6 Jews remaining in Cairo, including their spiritual leader, Magda Tania Haroun, all women over the age of 65. There are a further 12 Jews in the city of Alexandria, whose spiritual leader is Ben Youssef Gaon. The Ahmadiyya movement in Egypt, which numbers up to 50,000 adherents in the country, was established in 1922 but has seen an increase in hostility and government repression as of the 21st century. The Al-Azhar University has denounced the Ahmadis and Ahmadis have been hounded by police along with other Muslim groups deemed to be deviant under Egypt's defamation laws. On 15 March 2010, nine Ahmadis were detained due to their adherence to the movement. Police also regularly detain those without correct documentation and thus some Bahá'ís frequently stay home to avoid possible arrest. In 2008 a court case allowed Bahá'ís to obtain birth certificates and identification documents, so long as they omit their religion on court documents. Informal estimates about Bahá'ís population in Egypt suggest that there are approximately 2000 Bahá'ís currently resident in Egypt, though some go several times higher. Since their faith is not officially recognized by the state, they were not allowed to use it on their national identity cards. Without valid identity cards Bahá'ís encounter difficulty registering their children in school, opening bank accounts, and establishing businesses. On 16 December 2006, after only one hearing, the High Court of Egypt ruled against the Bahá'ís, stating that the government would not recognize their religion in official identification cards. The ruling left Bahá'ís unable to obtain ID cards, birth certificates, or death certificates. However, on January 29, 2008 Cairo's court of Administrative Justice, ruling on two related court cases, ruled in favour of the Bahá'ís, allowing them to obtain birth certificates and identification documents, so long as they omit their religion on court documents. The ruling accepted the compromise solution offered by the Bahá'ís, allowing for them to obtain identification papers without the Bahá'í Faith being officially recognized. During and since the 2011 Egyptian revolution tensions have remained high – homes have been burnt though Bahá'ís contributed to the dialog. Since 2011 Bahá'ís while hopeful remain concerned and a Salafi spokesman has said of Bahá'ís "We will prosecute the Bahai's (sic) on charge of treason." There are Egyptians who identify themselves as atheist and agnostic. It is however difficult to quantify their number as the stigma attached to being one makes it hard for irreligious Egyptians to publicly profess their views. Furthermore, public statements that can be deemed critical of Islam or Christianity can be tried under the country's notorious blasphemy law. Outspoken atheists, like Alber Saber, have been convicted under this law. These types of crime in Egypt hold a status similar to Antragsdelikt, legal proceedings only occur if a citizen takes the step of suing the person engaging in blasphemy, and cases are not initiated by the general prosecutor. In 2000, an openly atheist Egyptian writer, who called for the establishment of a local association for atheists, was tried on charges of insulting Islam in four of his books. The number of atheists is reportedly on the rise among the country's youth, many of whom organize and communicate with each other on the internet. In 2013 an Egyptian newspaper reported that 3 million out of 84 million Egyptians are atheists. While the government has acknowledged this trend, it has dealt with it as a problem that needs to be confronted, comparing it to religious extremism. In 2014 the Ministry of Youth and the Ministry of Awqaf announced a joint strategy to combat the spread of "harmful ideas" among the nation's youth, namely atheism and religious extremism. In December 2014 Dar al-Ifta, a government-affiliated Islamic centre of education and jurisprudence, claimed that there are 866 atheists in Egypt, a figure which amounts to 0.001% of the population and was called by The Guardian "suspiciously precise". Despite hostile sentiments towards them atheists in Egypt have become increasingly vocal on internet platforms like YouTube and Facebook since the Egyptian revolution of 2011, with some videos discussing atheist ideas receiving millions of views. In a 2011 Pew Research poll of 1,798 Muslims in Egypt, 63% of those surveyed supported "the death penalty for people who leave the Muslim religion." However, no such punishment actually exists in the country. In January 2018 the head of the parliament's religious committee, Amr Hamroush, suggested a bill to make atheism illegal, stating that "it [atheism] must be criminalised and categorised as contempt of religion because atheists have no doctrine and try to insult the Abrahamic religions". Atheists or irreligious people cannot change their official religious status, thus statistically they are counted as followers of the religion they were born with. ^ a b c "Controversy in Egypt after a prominent church figure declared the number of Copts in Egypt exceeds 12 million". Al Arabiya. November 2, 2008. ^ a b "How many Christians are there in Egypt?". Pew Research Center. 2011-02-16. Retrieved 2018-03-19. ^ a b "Religions in Egypt | PEW-GRF". www.globalreligiousfutures.org. Retrieved 2018-03-19. ^ a b c "Egyptian Copts reject population estimate – Politics – Egypt – Ahram Online". english.ahram.org.eg. Retrieved 2015-11-27. ^ "New Egyptian Constitution Holds Promise for Copts". National Catholic Register. Retrieved 2019-03-19. ^ a b c "Egypt, International Religious Freedom Report 2008". Bureau of Democracy, Human Rights, and Labor. September 19, 2008. ^ "Copts welcome Presidential announcement on Eastern Christmas Holiday", Arabic News, December 20, 2002, archived from the original on September 30, 2007 . ^ Egypt: Overview of human rights issues in Egypt. 2005, Human Rights Watch, 2006-01-18 . ^ Morrow, Adam (April 24, 2006). "EGYPT: Attacks Raise Fear of Religious Discord". Inter Press Service. Retrieved 2008-10-08. ^ "Egypt's Sisi meets world Evangelical churches delegation in Cairo – Politics – Egypt – Ahram Online". english.ahram.org.eg. Retrieved 2018-02-28. ^ "Egyptian Copts reject population estimate – Politics – Egypt – Ahram Online". english.ahram.org.eg. Retrieved 2018-02-28. ^ "The Copts and Their Political Implications in Egypt". Washington Institute for Near East Policy. October 25, 2005. ^ "Egypt Round 6 Data (2016) | Afrobarometer". afrobarometer.org. Retrieved 2017-10-08. ^ a b . "Egypt". The World Factbook. American Central Intelligence Agency (CIA). September 4, 2008. ^ "Muslim population", The 2009 American Pew Forum on Religion and Public Life (PDF), archived from the original (PDF) on 2009-10-10 . ^ "Religion/Islamic conservatism's revival attracts followers, worries governments". Star Wars Tribune. June 18, 2009. ^ a b c "Egypt". Bureau of Near Eastern Affairs. United States Department of State. September 30, 2008. ^ a b c "Egypt". Foreign and Commonwealth Office. UK Ministry of Foreign Affairs. August 15, 2008. Archived from the original on December 12, 2012. ^ a b c d e f g h i j k l m "Egypt Religions & Peoples". Encyclopedia. LookLex. September 30, 2008. ^ a b "Egypt". Encarta. Microsoft. September 30, 2008. Archived from the original on October 31, 2009. ^ a b "Pope Shenouda III declares to a TV station that the number of Copts in Egypt exceeds 12 million". October 29, 2008. ^ a b Hoffman, Valerie J (1995), Sufism, Mystics, and Saints in Modern Egypt, University of South Carolina Press . ^ Khalil, Mohammad Hassan. Between Heaven and Hell: Islam, Salvation, and the Fate of Others. Oxford University Press. p. 297. Retrieved June 2, 2014. ^ "Egypt: Attack On Shia Comes At Dangerous Time". Retrieved 2015-10-06. ^ "Four Egyptian Shi'ites killed in attack by Sunni Muslims". Reuters. 2013-06-23. Retrieved 2015-10-06. ^ Bengali, Shashank (2013-08-10). "Egypt's Shiite Muslims saw the Sunni hatred grow under Morsi". Los Angeles Times. ISSN 0458-3035. Retrieved 2015-10-07. ^ a b "Egypt's Sisi meets world Evangelical churches delegation". english.ahram.org.eg. Al-Ahram. Retrieved 30 November 2017. ^ "Egyptian Copts reject population estimate – Politics – Egypt – Ahram Online". english.ahram.org.eg. Retrieved 2018-02-14. ^ Who are the Christians in the Middle East?. Betty Jane Bailey. Retrieved June 19, 2009. ^ a b "Egypt's Jewish community diminished to 6 women after death of Lucy Saul". egyptindependent.com. Retrieved 2017-03-03. ^ a b c "Religious Freedom in Egypt". Egypt (essay). George town. Archived from the original on March 25, 2014. Retrieved 2011-12-14. ^ a b c "Government Must Find Solution for Baha'i Egyptians". Egyptian Initiative for Personal Rights. 2006-12-16. Retrieved 2006-12-16. ^ a b c Johnston, Cynthia (2008-01-29). "Egypt Baha'is win court fight over identity papers". Reuters. Archived from the original on 2008-02-15. Retrieved 2008-01-30. ^ "Egypt", World report, Human Rights Watch, 2007-01-11, archived from the original on 2008-09-28 . ^ Egypt: national unity & the Coptic issue, Ahram, 2004-07-05, archived from the original on 2007-09-12 . ^ Audi, Nadim (February 11, 2008). "Egyptian Court Allows Return to Christianity". The New York Times. Retrieved 2008-10-07. ^ Associated Press. Egypt court upholds right of converted Muslims to return to Christianity Archived 2011-11-21 at the Wayback Machine. 2008-02-09. ^ AFP. Egypt allows converts to revert to Christianity on ID Archived 2009-04-16 at the Wayback Machine. February, 2008. ^ Harvard encyclopedia of American ethnic groups By Stephan Thernstrom. Page 242. ^ WorldWide Religious News. Church Building Regulations Eased Archived 2009-03-18 at the Wayback Machine. December 13, 2005. ^ a b c "Egypt, International Religious Freedom Report 2006". Bureau of Democracy, Human Rights, and Labor. September 15, 2006. ^ Miles, Hugh (April 15, 2006). "Coptic Christians attacked in churches". The Telegraph. Retrieved 2008-10-07. ^ "Egyptians riot after seven killed in Church attack". NBC NEWS. January 7, 2010. Retrieved October 10, 2011. ^ "Bomb hits Alexandria church at New Year's Mass, 21 dead". ^ "11 killed, churches burned in Cairo". Retrieved 12 May 2011. ^ "Sectarian tensions rise in wake of crime boss death – Daily News Egypt". Daily News Egypt. 2012-10-15. Retrieved 2018-03-19. ^ "The Open Doors World Watch List 2013". Open Doors. ^ "Egyptian people section from the World Factbook". World Fact Book. Retrieved 2007-01-29. ^ Cole, Ethan (July 8, 2008). "Egypt's Christian-Muslim Gap Growing Bigger". The Christian Post. Retrieved 2008-10-02. ^ "Egypt's last Jews aim to keep heritage alive". timesofisrael.com. 26 March 2017. ^ Jones-Pauly, Christina; Tuqan, Abir Dajani (2011). Women Under Islam: Gender Justice and the Politics of Islamic Law. I.B.Tauris. p. 416. ISBN 978-1-84511-386-5. ^ Sarah Carr (19 November 2012). "Insult laws: Elusive and longstanding". Egypt Independent. Retrieved 26 September 2017. ^ "Rights group demands release of Ahmadiyya detainees". 16 May 2010. Retrieved 4 October 2017. ^ "Egypt Ahmadis detained under emergency law: rights group". 14 May 2010. Retrieved 4 October 2017. ^ a b U.S. Department of State (2006-09-15). "Egypt: International Religious Freedom Report". Bureau of Democracy, Human Rights, and Labor. Retrieved 2007-05-08. ^ IRIN (2006-05-16). "EGYPT: Court suspends ruling recognising Bahai rights". Reuters. Retrieved 2008-03-28. ^ a b "Egypt's forgotten Baha'i community fearful and hopeful of future". Bikya Masr. 2012-01-07. Archived from the original on 2012-03-21. Retrieved 2012-02-25. ^ a b al-Shahat, Abdel Moneim (2012-02-18). "Shahat: Baha'is threaten Egypt's national security". Egypt Independent. Retrieved 2012-02-25. ^ AFP (2008-01-30). "Egypt's Bahais score breakthrough in religious freedom case". AFP. Retrieved 2008-01-30. ^ BWNS (2008-01-29). "Egypt court upholds Baha'i plea in religious freedom cases". Bahá'í World News Service. Retrieved 2008-01-30. ^ Bahá’ís of Egypt (April 2011). "An open letter to the people of Egypt". www.bahai-egypt.org. Archived from the original on 2011-04-09. Retrieved 2012-02-25. ^ "Who is afraid of Egyptian atheists?". Al Arabiya. Retrieved 2013-11-20. ^ "Controversial Egyptian film 'The Atheist' gets go ahead by censors". Al Arabiya. Retrieved 2012-07-10. ^ a b c Halawi, Jailan (December 27, 2000). "Limits to expression". Al-Ahram Weekly. Archived from the original on December 26, 2004. ^ "Leaving Islam in the age of Islamism". Daily News. Retrieved 2014-03-31. ^ "Egypt: Are there really three million atheists?". BBC News. 2013-11-19. Retrieved 2014-11-15. ^ "Govt announces campaign to save youth from atheism". Mada Masr. Retrieved 26 April 2018. ^ Kingsley, Patrick (12 December 2014). "Egypt's atheists number 866 – precisely". Guardian News and Media Limited. Retrieved 25 December 2014. ^ Jackson, Anthon. "A Life of Pretending: Being Egyptian and Atheist". Quillette. ^ "The World's Muslims: Religion, Politics and Society" (PDF). Pew Research Center. 30 April 2013. Retrieved 20 February 2017. ^ Winston, Kimberly (4 January 2018). "Egyptian Parliament considers outlawing atheism". World-Wide Religions News (WWRN). Retrieved 26 March 2018.